The Application Process for the 2019 Pay It Forward Scholarship has officially re-opened! Scholarship Applications are due by March 21, 2018. Scholarship Recipients will be notified by March 28,2018.
and all you need to do is………………. EAT!!!!! attendees who dine at the restaurant April 19-21!!!! helping raise money for NER. our own New England Region members. Contribute a song(s) that you would like to share with others. @ emurphy.sings@gmail.com by April 7th. the purpose of the song. be available for purchase at the conference. the NER’s Membership Support Program. Don’t Miss Out on Being A Part of Vol. 1 !!!!!! Webmistress Mulcahy | Comments Off on CALLING ALL SONGWRITERS!!!!!! Just as January has come to a close, so has our “Jeans in January” Fundraiser. Please tally the days you participated and send in $1.00 for each day that you participated in the “Jeans in January” fundraiser. Your payment can be made through the NER website via the Donation button or by mail to the NER Treasurer, Bekah DeMieri. Thank you for participating in the fundraiser that helps to support our Membership Support Program. The preparation for the NER-AMTA 2018 conference has begun, and we hope that you are as excited as we are to be back in Westbrook, CT at the gorgeous Water’s Edge Resort and Spa. Our conference is titled: Uniting in Diversity: Bringing Together the Individuals of the Music Therapy Community, and we look forward to a time of growth, rejuvenation, learning, and connecting with our friends and colleagues. We hope that you will consider submitting a proposal for a concurrent session, CMTE, or research poster at the regional conference. We had many fantastic suggestions on session topics from last year’s conference evaluations, and they include: diversity, multicultural topics, neurologic music therapy, research, ethics, varied theoretical orientations, medical settings, school age populations, autism, collaborating with disciplines outside of the music therapy profession, trauma, community building, improvisation, and guitar skills. If you feel like you have expertise in these or any other subjects, please submit your proposal as we hope to have a varied and diverse program! The last day for submissions is SUNDAY, JANUARY 14, 2018. We look forward to seeing you April 19-21, 2018 as we focus on creating community and cohesion within ourselves and our profession. support Music Therapy by participating with you. At the end of the month, contribute your donation to NER! During this 5 Day Spring Sale my Barefoot Books customers will get 20% off all purchases! This event is a double fundraiser!! *Between Friday April 21st and Tuesday April 24th, Customers may purchase Barefoot Book items from my personal inventory which I will post in this event. Customers may also purchase any items from our new Spring/Summer catalog. All customers will get 20% off. *Shipping rates apply and I will post the shipping rate table on the event page. *Shipping will be waived for customers who purchase items from my personal inventory AND who can pick up their purchases at The Sonatina Center in Dover, NH. *TO SHOP: Customers can first view my in-stock item photos in the event page and comment “SOLD” on items they wish to purchase. I will also provide a link to view the spring/summer catalog. For catalog purchases, customers can send Marissa’s Barefoot Bookshelf a private message with their selections. I will be in touch about shipping rates and to collect shipping addresses. Customers may order from both the in-stock inventory AND the catalog. Following our conversation, customers will receive their invoices. *Also, SPECIAL OFFER: Customers who book an online or in-person event with me in May will receive a $15 Amazon giftcard! Message me to schedule your event! 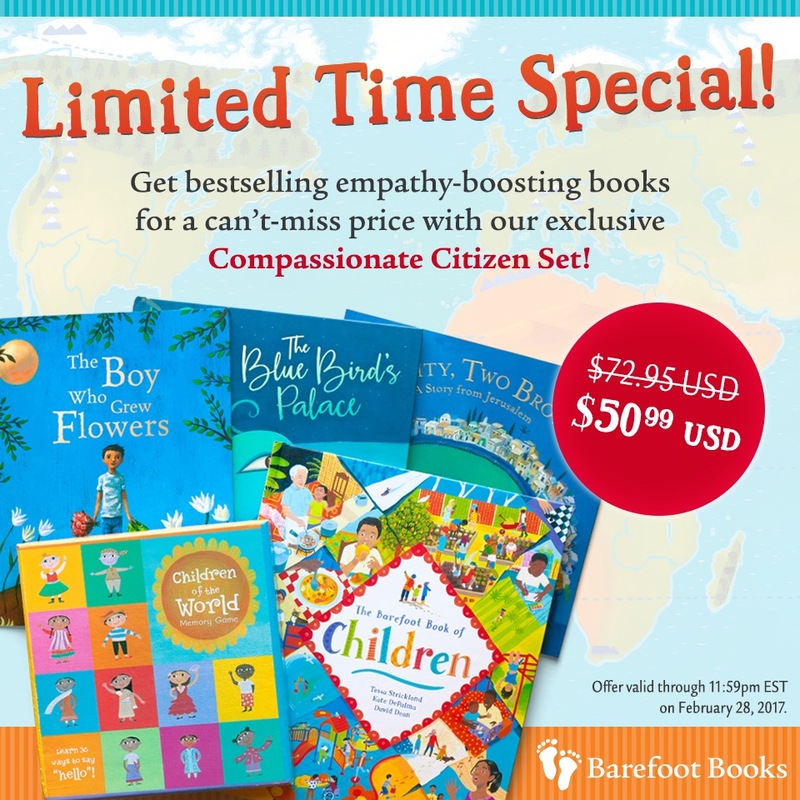 The Barefoot Books fundraiser for NER continues with a special February offer of 30% off a set of books: The Compassionate Citizen set. Remember: a portion of your purchase goes towards the NER Membership Support Program.